Star Wars: The Force Awakens is the little-known sequel that hasn’t really been on anybody’s radar… Wow could you imagine if that was true? No, in reality this film is probably one of the most highly anticipated sequels to ever be produced, and since its release it has been shattering records left right and centre. Bringing back the Star Wars universe to the silver screen after the largely disappointing prequel trilogy is no lean feat however and one has to wonder; does this new movie use the Force for good, or does it succumb to the Dark Side? SPOILER ALERT: I will be delving into some plot and character spoilers so if you haven’t seen the movie yet then I would suggest driving down to your local cinema right now and doing so and then come back and keep reading. From the very first title crawl, you can tell that Star Wars: The Force Awakens has learned from its past demons and will come out stronger. There are no mentions of trade disputes or intergalactic senates. Instead we get told that Luke Skywalker is missing and that both the Resistance and the First Order are looking for him. That is all we need to jump into the story and that is all we are given. One thing I noticed when watching the movie was that it followed a very similar plot structure to A New Hope. In fact the first act is almost a beat for beat adaptation of the ’77 original movie. Opening with the rebel fighter putting secret plans in a droid, while being subsequently captured. Then the droid finds a lonely orphan on a desert planet who has a greater destiny in front of them. Even boarding the Millennium Falcon to avoid the troopers that are hunting them, the entire first third of the movie is something we have seen before. This trend follows throughout the rest of the movie, with Han Solo even commenting in a very meta/tongue-in-cheek manner that the First Order’s Starkiller Base is “another Death Star.” This sense of familiarity and the plot mirroring that of A New Hope is a bit of a double-edged sword in that in some ways it offers little new for long-time fans (at least in the beginning sections of the movie) but at the same time the fresh, new take creates a strong sense of connection to the previous films and offers a little nostalgia trip while showcasing the whole “everything that was old is new again” mentality. I personally loved being able to tie the plot back to A New Hope because to me it just made the whole thing feel like the beginning of a new Star Wars story, and it was done so sublimely that I am excited and eager to see where they take it from here (although, if later instalments feature more moon or planet sized space stations that are capable of blowing up planets or star systems then I will probably change my tone a little bit). As with most movies, the story hinges on a few select characters. 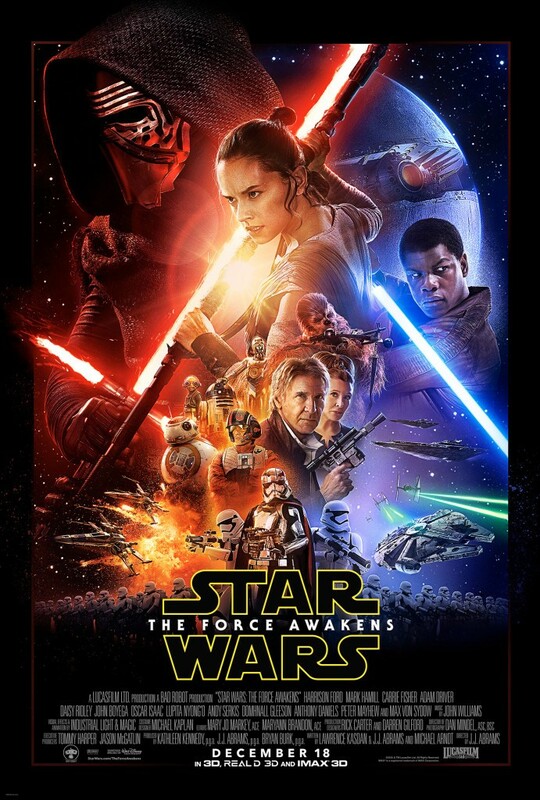 Since this is a Star Wars movie, the cast is a mixture of returning veterans and newcomers to the series. Thankfully, while the returning characters all have their roles to play, especially Harrison Ford who gives his best performance in years as the weary, but still lovable scoundrel Han Solo, the story is really about the new group of characters; Finn (John Boyega), Poe (Oscar Isaacs), Rey (Daisy Ridley) and BB-8. Rey and Finn have incredible on-screen chemisty and have both so embodied their characters that it is hard not to love them. Rey manages to steal the show as our orphan with a greater destiny, while Finn is the comic relief character – a Storm Trooper who has realised that the First Order may not be the beacons of good will that he had originally hoped. The best part of these two characters is the emotional depth that they being to the film. Finn is just trying to do good even though he is in way over his head and Rey is struggling to find herself and her place in life after being abandoned on the desert planed of Jakku as an infant. Standing opposite our heroes is the film’s villain – Kylo Ren. Kylo is perhaps one of the most unique, original and multi-faceted characters we have ever seen in a Star Wars film. While we have seen film heroes Annakin and Luke be tempted to the Dark Side (with varying degrees of success), Kylo is almost the exact opposite. He has already succumbed to the darkness when he killed all of Luke’s new Jedi apprentices, but in his own words keeps feeling “the pull towards the light.” This conflict even comes into play several times through the course of the movie and provides a really good dynamic for the character, especially during the climactic scene where Kylo and Han are face to face inside the Starkiller Base. Kylo admits that he is struggling between the two sides of the force, and makes the decision to slay his father in order to solidify himself as evil. This scene is gut-wrenching and powerful, giving a real sense of inner turmoil to the character and leading us to what will no doubt be a huge plot arc in the future instalments. One last point about Ren is that he is almost two characters. Whenever he is in his mask and robe, he is this imposing, fearful warrior, but whenever he takes it off you see that it is all a charade and that he is hiding what is in reality a sad, insolent, pouty child. I loved the duality of the character and cannot wait to see how it plays out in the future. Visually, Star Wars: The Force Awakens is incredible. From the different planets, to the mixture of live action and CGI, everything just looks fantastic. Everything has that traditional Star Wars look to it, but seems to be covered in this sheen of freshness. Costuming, props, character design, it is all amazing and not only helps build this universe but feels so distinctly Star Wars that it is hard to not smile at every shot. One of the most impressive scenes in the film was the confrontation between Kylo Ren and Han Solo. While Ren is telling his father that he is conflicted, he is bathed in both blue and red light, but as he succumbs to the Dark Side more and more, the blue is replaced. The awesome visual metaphor coinciding with the action on screen was incredible and heightened an already emotionally charged scene. While it is an amazing visual spectacle, some aspects left me scratching my head. Firstly, the whole Star Wars universe just seems so small and compact. When the Starkiller Base fires and wipes out a Star System, people lightyears away can see it happening in the sky as if it was a meteor shower happening right above their heads. Coupled with the fact that we never really get any sense of time or length of travel when using the Starships and you have a Galaxy that feels no bigger than your local suburb. As you might expect, this film is chock a block full of tiny easter eggs and tidbits designed to hook fans. Sometimes in movies or games these can get a little over the top, but for the most part I found that J.J and crew really used these to enhance the storyline. The best example is when Rey first finds Annakin’s/Luke’s Lightsaber, and you can hear the voices of Yoda and Obi-Wan Kenobi (in an awesome little splice up of old Alec Guinness dialogue and new audio recorded by Ewan McGregor) in the background talking to Rey through the force. Cool little things like that are strewn throughout the movie and really make some scenes pop. 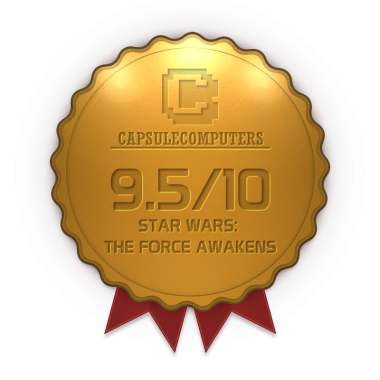 While it isn’t perfect, and can feel like it is retreading old ground, Star Wars: The Force Awakens is an experience like none other. It accomplishes two things to perfection; firstly, it feels like a Star Wars movie and secondly it evokes this sense of childlike wonder while you are watching it. Looking around at the people in the cinema and seeing everyone from ages 4 to 70 sitting there wide eyed and silent is a beautiful sight, and one that not many films can pull off. Sure I would have liked J.J to make the universe feel a bit bigger, and some of the plot points may get tiresome if they are reused again in later movies, but without question The Force Awakens is the most fun I have had watching a movie this year.